Yes, it's Banned Books Week again. Can you believe some of the books that have been banned by various groups around the USA? I mean, hello? Wait -- what? Brown Bear, Brown Bear, What Do You See? You're kidding, right? Nope. Apparently the State Board of Education in Texas got Bill Martin mixed up with another Bill Martin, who wrote a book called Ethical Marxism. They wanted to ban all books written by Bill Martin. And heaven forbid that we read a book to our two-year-olds which might possibly be written by a communist. Just how closed-minded are people? On second thought, don't answer that. There's some great stuff all over the internet right now about the evils of book banning. Read Laurie Halse Anderson's moving post about Speak. And this is the ALA's official site. I defy you not to cry when you read C.J. Redwine's post about Speak. And finally, for something lighter, here's a wonderfully sarcastic post by Liz B over at A Chair, A Fireplace & a Tea Cozy. They've all said it much better than I can. And now, I'm going to pick up one of these banned books and start reading. Celebrate the freedom to read! Tell me -- what's YOUR favorite banned book? 1. Go find your favorite banned book. 2. Take a picture of yourself with said book. 3. Give that book some love by explaining why you think it is an important book. 4. Post it to your blog. So here I am reading my old yellowed copy of The Egypt Game by Zilpha Keatley Snyder. This book, more than anything else on the list, made me want to write for children. Well, that and The Secret Garden -- but that hasn't been banned as far as I know. The Professor, the silent boy, Marshall, and the mystery of who is killing neighborhood children all drew me in, of course. But April and Melanie's game itself fascinated me. I'm sure this was because when I was little my parents had a small wax bust of Nefertiti on their bookshelf. I loved to look at it, even though I had no clue who she was -- but she was exotic and mysterious. And besides that, Zilpha Keatley Snyder can write up a storm. Spread the word! Post a pic of yourself reading YOUR favorite banned book. And tell me about it! Scott Westerfeld is my hero. He's a master craftsman. And writes books you want to keep reading. I've been a fan of his since I read So Yesterday in 2005. Then Uglies, Pretties, Specials, and Extras made me love him even more. In 2009, he switched gears with Leviathan. It was my first experience with steampunk. And I found it awesome. 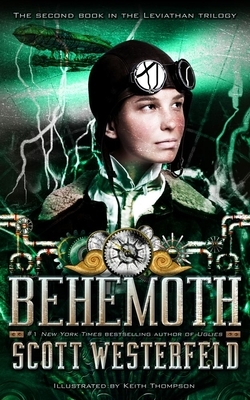 Behemoth, the second volume in the Leviathan trilogy, arrives on October 5th. I've read the ARC and the story is even more exciting than Leviathan. And, most awesome of all, I get to meet my hero on Wednesday, October 6th, when he is scheduled to appear at Chester County Book & Music Company at 7 pm (*coughcough*shameless plug for my employer*coughcough*). If you live anywhere near the suburban Philadelphia area and you want to meet Scott Westerfeld and buy a copy of one of his books (and get it signed! ), please join us. 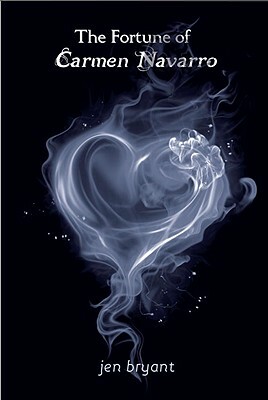 The Fortune of Carmen Navarro, by local Pennsylvania author Jen Bryant (Knopf, ages 12 and up). And isn't that a cool cover? As a bookseller, I'm always eager to support local authors (see my post about Dianne K. Salerni's book). The amazing Jen Bryant has written fifteen books for children, including the award-winning River of Words: the story of William Carlos Williams, and The Trial (about the Lindbergh baby kidnapping), Pieces of Georgia (which takes place in Chester County, PA and the Brandywine River Museum), Ringside 1925: Views from the Scopes Trial, and Kaleidoscope Eyes. All of those novels were written in verse. The Fortune of Carmen Navarro, however, is a straight-forward prose narrative. This feels different from anything Jen has written before. And I love it. Like Linger, by Maggie Stiefvater, the story is told by four different teen characters in alternating chapters. It's a compelling read, loosely based on Bizet's opera Carmen, with a modern twist. But even if you know nothing about the opera or the original novella that inspired it, you'll still be moved by this book. Carmen is a high school dropout, working at the Quikmart with her best friend Maggie, and hoping to make it big with her band, The Gypsy Lovers. Then one day two cadets from nearby Valley Forge Military Academy, Will and Ryan, walk into the Quikmart, and everything changes. Ryan falls instantly in love with Carmen, who is happy to flirt with the cute soldado. They go on dates to places like Valley Forge park and the King of Prussia Mall (which you'll recognize if you're from anywhere close to the Philadelphia suburban area). She writes a new song inspired by him, a song that gives the band their first chance at a recording contract. Ryan's feelings for Carmen soon become obsessive, even unhealthy. Previously a model student and cadet captain, he stops caring about school, friends, and family. His grades slip. He wants to spend all his time with Carmen. But Carmen is too independent to be the girl Ryan wants her to be. A timeless story of obsessive love. What's your favorite obsessive love story? Yes. That's Albus Dumbledore speaking on page 297 in Harry Potter and the Sorcerer's Stone. death is but the next great adventure." 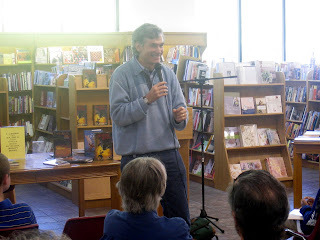 I've been trying to think of something to say about Joe Drabyak, my fellow bookseller who died just over two weeks ago. All of us in the bookselling community and especially at Chester County Book & Music Company are shocked and saddened by his death. 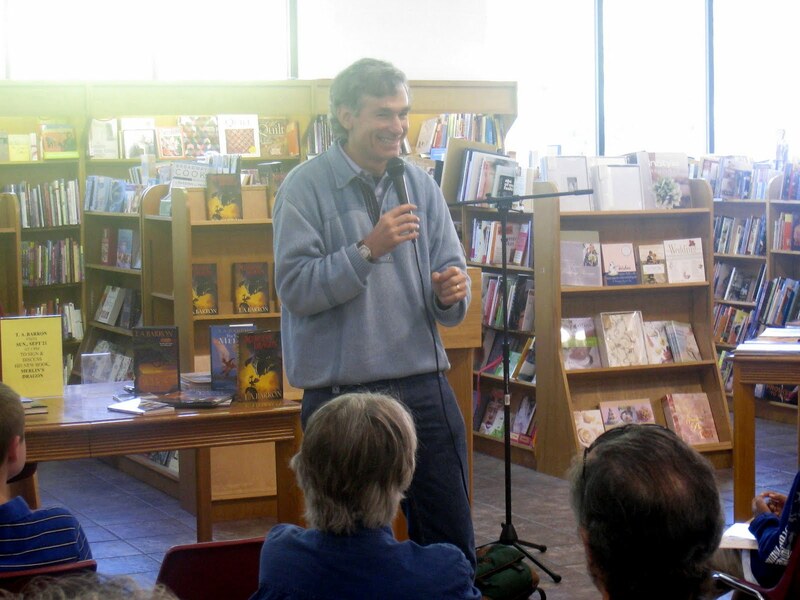 Joe was a staunch supporter of independent bookstores, and of new authors who had slipped between the cracks and were left behind by the big chains. Joe was the only bookseller I knew who had at least a dozen characters in books named for him. You can read more eloquent obituaries here and here and especially this touching one from Michelle of Michelle's Minions. I wanted to say something here, but I didn't know what to say. But then I thought of Dumbledore. It's not such a stretch. Joe was a wizard of a bookseller. And although he sold adult fiction and nonfiction and didn't know much about kids' books, Joe agreed to portray Dumbledore once for a midnight Harry Potter party. Unfortunately, I have no pics of that momentous occasion. But you can see the resemblance, right? Rest in peace, Joe. Hope you are having the next great adventure. And that it involves lots of books. What have you accomplished lately? This past weekend (a holiday weekend here in the US), I finally finished writing the rough draft of my first novel, a middle-grade fantasy. I didn't tackle it head on until January 2010, when I was challenged by a member of my critique group (to whom I owe undying thanks) to write 1000 words a week. That's all. For me, it was. I'd been spending two years writing a few dozen 500-word picture books. Well, something clicked this time and I steadily added to my word count. In eight months, I wrote 33K words. My total now stands at 38, 496. Of course, it's just a rough draft. I've got a lot of revising to do. And it's so full of plot holes, if it were a ship, it would sink. It may never be published, but so what? Plenty of authors never published their first book. T.A. Barron told me in September 2008, when he visited the bookstore, that his first novel is still in a drawer and it's going to remain there. 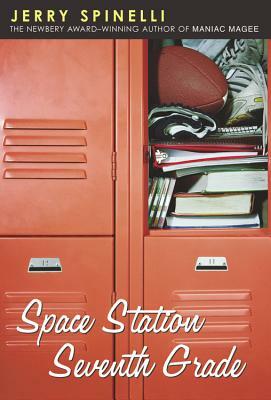 Even the wonderful Newbery-winning author Jerry Spinelli had at least three novels rejected until he finally scored with Space Station Seventh Grade (shown here with newer cover). Tell me about YOUR accomplishments this summer (or winter, if you live in Australia). Did you finish a novel? Or start a new one? Did you write something special? Did you read more than you did the summer before? Did you raise money for your favorite cause? Feel free to share. We can all use some good news. Moon Over Manifest, by Clare Vanderpool (Delacorte, for ages 9 to 12). Moon Over Manifest is one of those rare novels that you want to start reading all over again the minute you finish it. And touching and sweet and funny. Vanderpool's debut is impressive for its depth, characterizations, rich texture and many-layered plot. My WIP is a middle-grade novel and I despair -- DESPAIR, I tell you -- of ever being able to write this well. It's 1936 and twelve-year-old Abilene Tucker is sent by her daddy to spend the summer with Shady Howard, an old friend of his, in Manifest, Kansas. Gideon Tucker has to work a railroad job and thinks Abilene is getting too old to tag along. Stuck in the small dusty town during the height of the Depression, Abilene tries to avoid getting to know any of the townspeople. After all, she'll only be here for the summer. But she's drawn in anyway. Soon she's hanging around with Lettie and Ruthanne, trying to solve the mystery of who The Rattler is, or doing chores for Miss Sadie the fortune-teller, who begins to weave a tale for Abilene. Abilene finds a cigar box full of old treasures, and Sadie's stories gradually explain the treasures and what they meant to two friends in 1918. Writing two alternating timelines HAS to be difficult, but Vanderpool pulls it off beautifully. As you read, you find yourself beginning to truly care about these people, the hardworking citizens of Manifest, both in 1918 and 1936, the miners, the merchants, and especially Hattie Mae, Sister Redempta, Miss Sadie, and Shady Howard, who all appear in both timelines. Along with Abilene, you wonder when her father will come into the stories, because Abilene hungers for any insight into her quiet father's character. It isn't hard to guess who her father is in the stories from 1918, but it doesn't matter because it's so touching. This isn't just a story about family and love and sacrifice. It's about friends who are like family. Really, it's about an entire town and its people -- people from many different ethnic backgrounds -- and how they come together in a crisis. The author expertly juggles numerous characters and you get to know each one. You also feel you are actually there. Clare Vanderpool has done her research. But she's not feeding you dry facts about Prohibition or the Spanish Influenza. She makes history come to life with lots of sensory details, colorful characters, and vivid dialogue. This would be an excellent book for teachers and librarians, and anyone who loves historical fiction. What books have YOU finished lately that you wanted to start reading all over again? A former bookseller, I write children's books, poetry, and flash fiction. My short fiction and poetry have appeared in numerous literary journals. My rebus story, "Storm Magic," was published in the October 2016 issue of Highlights. I'm a survivor of two ruptured brain aneurysms, twelve years apart, so I'm allowed to occasionally forget something. I post on Mondays, except when I'm too busy writing! While I'm happy to accept review copies provided by publishers, and I do read as many as possible, I can't guarantee a review on the blog. If I don't consider it at least a 4-star book, I simply won't review it. I'm very sorry, but at this time, I'm still not reviewing self-published books or books you had to pay to publish. c 2017 Joanne R Fritz. All rights reserved. Picture Window theme. Theme images by Storman. Powered by Blogger.